If there’s any room in the home that deserves a touch of elegance and whimsy to wash away the stresses of the day, it’s the bedroom. 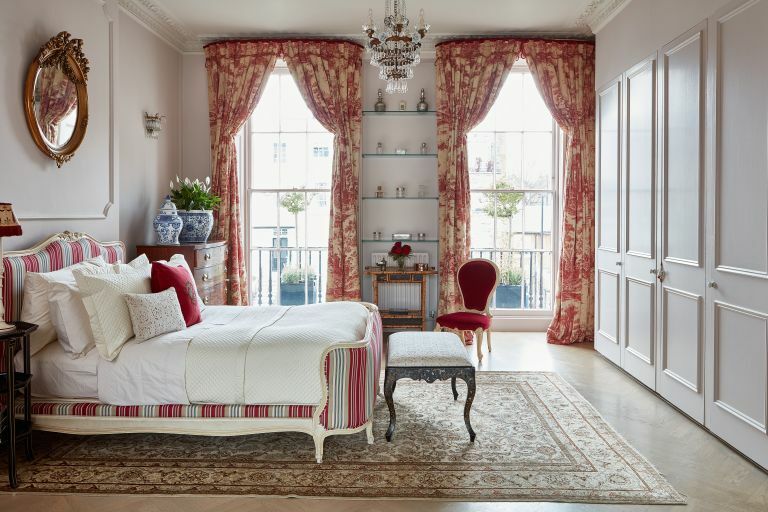 A firm favourite among period homeowners, the romantic, French-inspired bedroom design is easy to achieve by following a few classic tips and investing in key bedroom furniture pieces. Set the tone with a statement bed; choose a vintage-style frame with sinuous curves and lavish treatment such as gilding or deep-buttoned upholstery. For a light-filled, heavenly space opt for walls and floors in white, cream, or soft pastel shades. Ornate wallpapers and draped window treatments really come into their own in French-style bedrooms. Finish by layering plenty of pretty textiles such as ditsy florals or silky satins, not forgetting that all-important chandelier to add sparkle. Designing a bedroom from scratch? Be sure to go and have a read of our ultimate guide to planning your bedroom design, to make sure you get the key things right first. Combine toile prints and wallpapers with bucolic scenes, such as the Babylon wallpaper design by Clarke & Clarke, with crisp white linen from Cologne & Cotton for a sophisticated romantic scheme. For more bedroom wallpaper ideas have a read through our feature. A show-stopping antique bed with a floral needlepoint headboard adds a pretty vintage touch to this rustic attic bedroom. Why not pinch this idea try piling up old suitcases for an easy alternative bedside table. Find more pretty headboards in our round-up. We also have included lots of lovely traditional bed side tables in our round up of the best bedside tables for every budget. Plain white walls allow the ornate antique mirrors and bed frame to shine through in this calming scheme set in a Georgian coastal home. Be inspired by these white bedroom design ideas. If you want to venture away from the all-white colour scheme, there are plenty more inspirational ideas over in our guide to choosing paint for period homes. A luxurious coronet, ornate dressing table and pretty drapes in Cameo Rose linen fabric by Kate Forman, give this farmhouse bedroom a quintessential French country feel. Love this bedroom? Take a peek at the rest of this beautiful country farmhouse renovation. In this French-style bedroom, walls papered with rolls of 19th-century American, hand block-printed wallpaper are balanced with an lace-edged antique bedspread in this pretty and immersive attic hideaway. If you have a bedroom as small as the one below, you are probably going to want to check out our small bedroom decorating ideas. Even in city homes, you'll find rustic-style French furniture to give it that authentic taste. This stand-out Lutece wallpaper in Prune by Manuel Canovas creates a magnificent backdrop for the elegant Margot king-size rattan bed from Loaf in this elegant, French-inspired bedroom. The inspiration for this elaborate bedroom came from a trip to Versailles. The Louis XVI-style bed was an Ebay purchase, showing this home’s lavish french-style interiors could be achieved affordably. Ditsy bedding layered with floral cushions and an eiderdown from Sarah Hardaker give this cool grey bedroom a feminine edge. Find a similar French bed at The French Bedroom Company. Have look through these bedlinen ideas for more inspiration. Panelled walls with raised bolection mouldings are painted in Parlour Rose by Fired Earth, creating a warming, pretty scheme in a renovated townhouse. Try Afternoon Tea for a similar antique shade of pink. If you are lucky enough to have been blessed with wall panelling in your home, or maybe you want to build them in, check out these wall panelling design ideas. And if you are as obsessed with pink interiors as we are, have a read through these pink decorating ideas too. Make a lavish statement with the Sacré Coeur Bed from The French Bedroom Company, complete with gold gilt frame and deep-buttoned pink velvet upholstery. After a luxurious velvet sofa to match? Have a read of our round up of the best velvet sofas. Walls in Calamine by Farrow & Ball create a soothing feminine feel in this bedroom. The pretty headboard is upholstered in Printed Fabric by Jean Monro. Love this soft colour? Don't miss our pastel decorating schemes for more inspiration. Elegant Louis XV chairs in soft pink and an elaborately carved bed from French Antique Warehouse contribute to a romantic, Gallic feel, while the rose garland adds a touch of whimsy in this French inspired bedroom. Create a feminine focal point in a muted bedroom with a statement bed such as this Herald Superb design by Vispring, upholstered in Tournier Fushia/Linen fabric by Sanderson. For an alternative take on the romantic look, paint walls and ceilings in a dark shade, furnish with antique Japanese pieces and accessorise with flirtatious grasses and glistening metallics. If you love dark and dramatic interiors, be sure to check out our gallery of decorating ideas for more inspiration. Try making a feature of characterful old walls by highlighting timber beams in pretty pastel shades, as done here in this 17th century French bedroom. Finish with floral bedding in coordinating colours for a boho-Gustavian feel. Read about restoring timber beams in our guide. Bursting with feminine florals, this bedroom is papered in English Rose by Sanderson and is crowned with an elegant coronet made from Kate Forman’s Cameo Rose fabric. Walls and distressed furniture in classic cream mix with chintz textiles to capture the essence of pretty vintage style in this master bedroom. You can easily give your existing furniture a French country feel with paint, to learn how have a read of our guide to creating a French country style paint effect.